The thesis of improving demand for US residential housing (driven by demographics) remains intact. 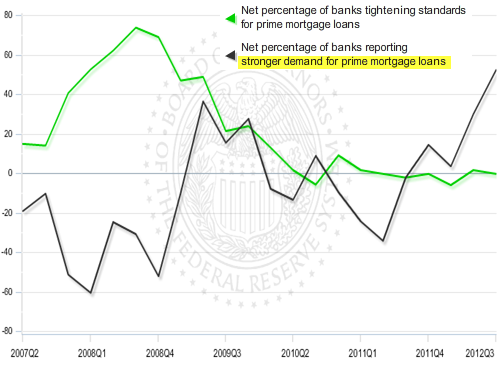 The latest bank survey from the Fed indicates demand for mortgage loans is on the rise. WSJ: - Nearly three in five U.S. banks surveyed by the Federal Reserve this summer said demand for loans to buy homes is growing as the housing market stabilizes and mortgage rates were falling to new lows. But according to bank credit officers, credit standards continue to be as tight as they were in 2010. WSJ: - The survey found that banks' credit standards aren't getting much easier for mortgage borrowers or small businesses. Among the loan officers surveyed, 93% said standards for approving mortgages to borrowers with strong credit were unchanged from the prior quarter, and 95% said standards were unchanged for firms with less than $50 million in annual sales. In the corporate space, lending to larger companies with poor credit has not been an issue - those firms simply have to pay a higher rate. The lower the credit rating, the higher the spread charged. That approach keeps credit growth in the corporate sector humming because the weaker credits are more lucrative for banks. Mortgages on the other hand continue to be fairly binary - one either qualifies for a standard Fannie mortgage or does not, and there is very little between the two. With the subprime lending gone, the market has become bifurcated into those who are able to obtain a loan and have access to incredibly cheap financing and those who are not. WSJ: - Buyers who qualify for loans are able to take advantage of extremely low rates. Average rates on 30-year-fixed mortgages have been below 4% since March and fell to around 3.5% last month, according to mortgage finance company Freddie Mac. Rates could fall even lower if the Fed takes further steps to prop up the economy later this year. Much of that is driven by reliance on the GSEs, since banks still don't want to hold non-standard long-term (15-30 years) exposure to residential housing on their balance sheets. Banks originate the loans and sell them to GSEs or hold them in a portfolio that could easily be sold to GSEs (Chase for example). In fact over 90 percent of all mortgage loan originations are still government backed via the FHA, VA, or GSEs.